The year of the Goat, Ram or Sheep is a period of gains and rewards coming from heroic efforts and kind deeds. The Goat also ushers in literally beautiful things and is a time marked by warm celebrations, beautiful music, excellent artistic contributions, and even beautiful faces. 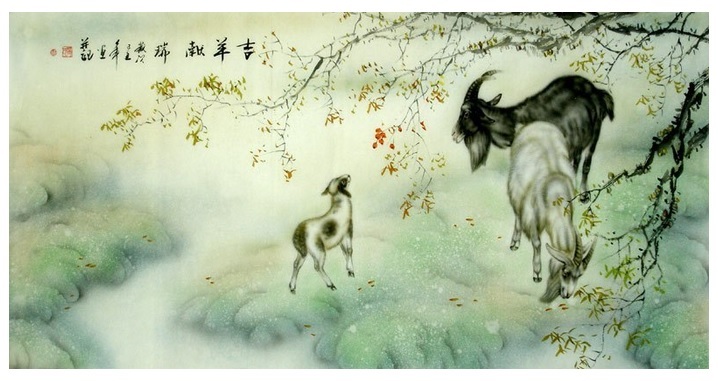 For the Chinese, a person born under the rule of the Goat can experience slightly more misfortunes than the rest, but they are also more attractive because of the Goat's overpowering vibration of beauty, love of symmetry, and predisposition toward tenderness. In Asia, the Goat and the Sheep are interchangeable, with the word Goat being accompanied by the image of a Sheep or Ram, and vice versa. The eighth symbol of the Chinese zodiac, the Goat is a timeless symbol of good fortune in most parts of the Orient. In China, it is an ancient symbol of children's devoutness and respect to parents that the locals call xiao. This symbol is based on the Goat's act of kneeling while suckling and the way kids and lambs dance around their parents. The Sheep is also dubbed the Precious White Jade in praise of its shiny fleece. 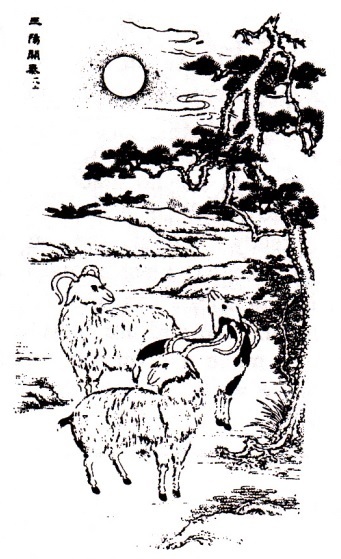 The Goat is admired for its mild disposition, and Precious White Jade has come to mean kindness or auspicious things. They say that people born in the year of the Goat can feel overdone in colors of gold and dark brown. Goat men and women are also likely to feel a little nervous and off in connection with the numbers 6, 7 and 8. As a compassionate creature, the Goat or Sheep shares its best moments with the Rabbit, the Horse and the Pig. Although Goat people share the Dog's devotedness and the Ox's sacrificial tendencies, they just tend to part ways when the going gets tough. In Chinese writing, the semantic element for Sheep is found in many positive words. These include the characters mei for beauty, shan for kind-heartedness, xiang for luck, and xian for brightness. And speaking of brightness, the Goat, particularly the female Goat, has been ritually connected to lightning. A primordial Asian tradition recounts how the she-goat's skull is the lightning god's vessel of blessings, which he poured down from heaven on farmers and shepherds. This is to keep the earth fertile and the people prosperous. Guangzhou, the largest city and capital of Guangdong, is called the City of Five Goats or Five Sheep. 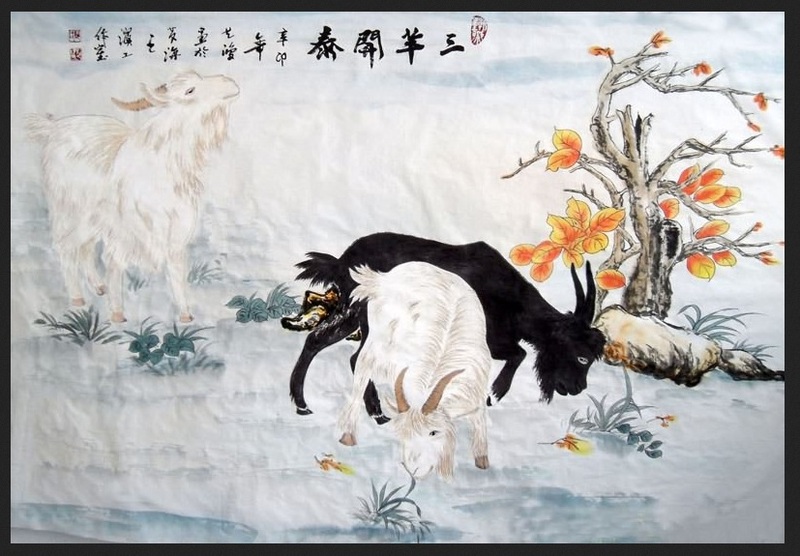 A popular folktale goes that once in the famine-stricken land of Chuting, the old name for Guangzhou, farmers beheld five Immortals went down from heaven, each riding a great Goat with a bunch of millet in its mouth. The Immortals gathered the farmers round and taught them how to grow millet to keep the land from suffering another famine. The Immortals disappeared after, and left behind their goats, which instantly became stone statues. Today, the legendary five stone sheep are beautifully represented in the Temple of the Five Immortals at the foot of the Po Shan Mountain. It is also not surprising that China honors a celestial sheep, Xie-zhi, given their fondness for Sheep. Xie-zhi has the power to single out cruel people and give them what they deserve. In ancient Hubei (the state of Chu), judges wore hats sewn with the image of Xie-zhi to symbolize their fairness in every case they hear. Use the Goat's vibration to invoke artistic inspiration and imagination. If you should see a group of nine Goats, then you can look forward to a long period of good fortune. If you are presented with a bunch of three Goats, you can expect pleasant times and happiness. Bring out the brilliance within me deep. Go to Chinese zodiac symbolisms from the Year of the Goat? You can also access more symbols and meanings from the Symbolisms home page. 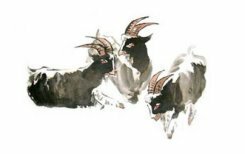 *Many thanks to artists Zhang Fu, Hu Yi Hong, and Yan Zhan Ping for the paintings featured in the Year of the Goat section. You can view these paintings done in traditional Chinese style at Ink Dance Chinese Paintings. Also featured on this page are a resin figurine of a goat, the Chinese symbol for Goat and an undated, anonymous pen drawing of three sheep grazing. Verse by PJ Blunn.